October | 2012 | hair, there and everywhere! Wow, it has been a few weeks since I have posted! Life has been very busy! I had a work trip and I am leaving for NC tomorrow for a quick trip home (unfortunately there is no time to get my hair done). 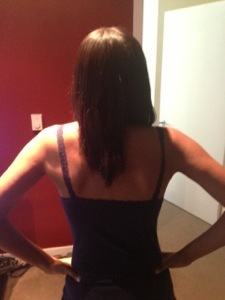 My hair has just been my hair! Nothing new to report. I have been doing roller sets for the past few weeks. Last week, I protective styled all week. We had our Christmas photos (will post soon) and I rolled my hair Friday morning. I will re-roll it tonight for my trip home. 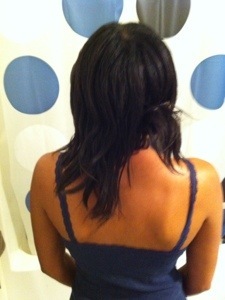 I will be getting a relaxer the week of Thanksgiving. At that time, I will be about 13 weeks post, which is perfect timing! (I always seem to plan my trip home near relaxer time … I am pushing off self-relaxing forever if possible! I have about an inch (+/- in a few places) of new growth … which is on par for the timeframe (8 weeks post). 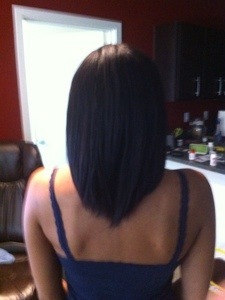 I think I will get to BSB this relaxer (and then cut some off) … we shall see. As long as I make BSB/BSL (which is pretty much the same thing on me) by February, I am OK! I have noticed I am not as hair-obsessed lately. Maybe it is because I have other crap going on … maybe it’s because getting to BSB is taking too long and I don’t have patience .. who knows? I had Nathan take some new photos this morning in the blue tank. 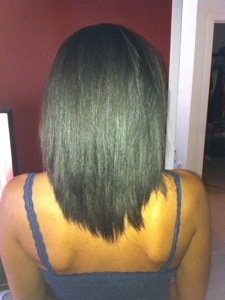 Since June, I have tried to do a monthly check in with the tank after I got it flat ironed. So the reason my hair will look a mess from here forward doing these photos is because I am not flat ironing my hair for a while so old slept on roller sets will have to do! Pardon my hair … It’s kinda gross today! It’s oily and need to be washed … Not to mention its hardly combed through the week. So take the pic for what it’s worth. 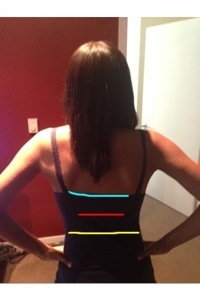 And note, the right side of my hair is clipped up because I did not want to manipulate it too much since its shedding!! The top of the tank is a good marker for BSL, in my opinion! I’m getting close, but not close enough!